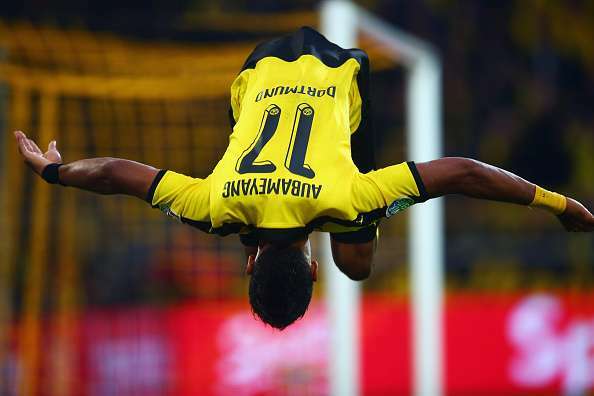 Pierre-Emerick Aubameyang to flip sides? It seems like there is no stopping Chinese clubs as another huge name is being linked with a move to the Chinese Super League. The honour, this time around, goes to Borussia Dortmund star, Pierre-Emerick Aubameyang, who is wanted by Chinese club, Shanghai SIPG. After the recent surge of foreign imports in the league, Chinese Super League authorities have reduced the number of foreign players in a team from five to four. However, that doesn’t seem to put a halt to Shanghai SIPG’s motivation as the club, managed by former Tottenham Hotspur manager Andre Villas-Boas, wants to acquire the signature of the highly-coveted Gabonese international. According to various sources, the Chinese club is plotting a world record-breaking €150 million—which is a lot higher than Dortmund’s valuation of €120 million—to lure the forward to Asia. Our sources further claim that the wages Shanghai SIPG are willing to offer would make the Dortmund star the highest paid player in the world by a long margin. With reported wages of €800,000-a-week, which trumps Carlos Tevez’s €735,000-per-week, it would be incredibly hard for Aubameyang to refuse Shanghai SIPG. However, the speedster’s desire—and promise to fulfill—to play for Real Madrid could be the deal breaker. This is not the first time that Shanghai SIPG have splashed the cash on one player. Only recently, they splurged a gargantuan amount of cash—somewhere around €70 million—for Chelsea and Brazil midfielder, Oscar. Not only that, the former Internacional talent’s wages trumps that of the two best players in the world, Cristiano Ronaldo and Lionel Messi, as he earns an eye-popping €470,000-a-week. However, it seems as though Shanghai SIPG aren’t content with just one star-signing as they are looking to add more firepower to their squad—someone to score as many goals as possible from Oscar’s creative passing—and Aubameyang has been identified as the player who can do it by manager Andre Villas-Boas. The uncertainty around life means that one can never say what happens next with assurance. However, with what is happening of late, it can be inferred that the Chinese League won’t stop and relentlessly keep pursuing big-name players in order to compete with the European clubs—and attracting a globally renowned and coveted star could be the smashing impact. While Shanghai SIPG will give it their all to sign Aubameyang, the latter’s desire to play for the Galacticos means that the deal might never happen. If however, it does, then we can safely say that Chinese clubs are no pushovers.